The EOS 1-year long ICO is about to come to an end. The EOS token has been issued on top of the Ethereum network as an ERC-20 token; basically an IOU token for markets to participate and determine the market value of the token before the real EOS tokens are being deployed on Mainnet. During the 1-year period ICO, the EOS price has made significant gains, and the current market cap ranking of 5 and CoinGecko ranking of 3 just behind Bitcoin and Ethereum. This is beause the EOS ERC-20 tokens have started trading on most major exchanges. As the EOS Mainnet launch date is approaching in less than 5 days (targeted on June 1, 2018 at 22:59:59 UTC), all ERC-20 based EOS tokens must be swapped to the EOS Mainnet token before the launch date or risk having those tokens frozen and no longer transferable on the Ethereum network. Note: If you own EOS token in your ethereum wallet as an ERC-20 token, you must swap your EOS token to the mainnet token before preferably before June 1, 2018 to avoid risk of losing EOS tokens. 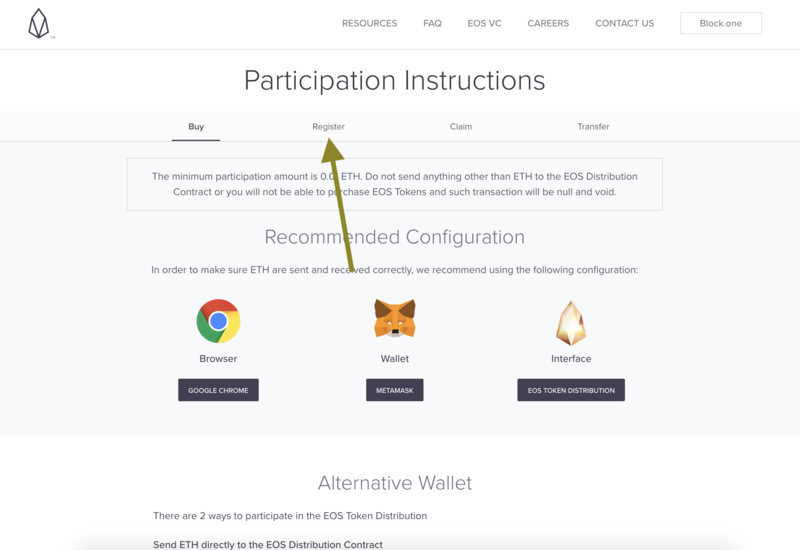 There are 2 ways to conduct the EOS mainnet token swap. A number of large exchanges have announced that they will support EOS mainnet tokens. In the announcement, they only require you to deposit the EOS ERC-20 tokens into the exchange wallet and everything will be taken care of. Large majority of these exchanges require the EOS ERC-20 tokens be deposited before 31st May, in any case do double check the cutoff dates. While convenient, the downside here is that it requires you to trust your fund completely to a central entity. 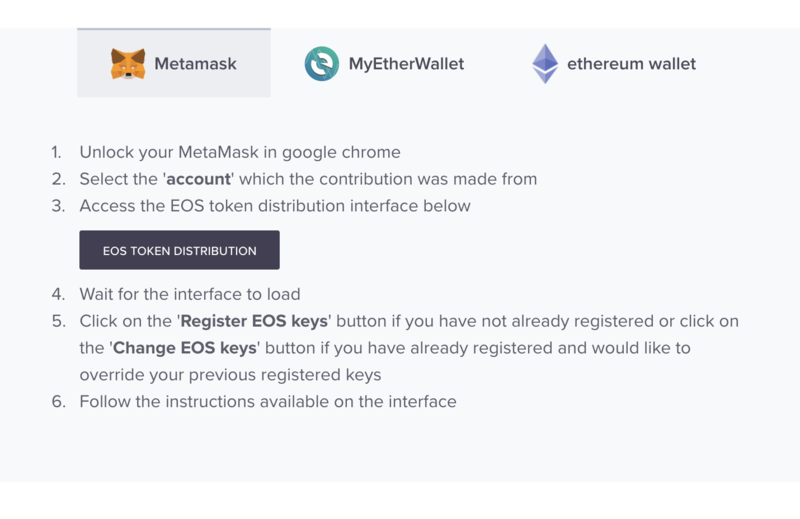 Below is a step-by-step guide on how to prepare your EOS ERC-20 tokens to the mainnet tokens while taking full control of your own private key. You'll complete this in less than 10 minutes. Before you begin, identify your ethereum wallet that contains the EOS ERC-20 token. You'll need to use this wallet's private key to sign the contract call transaction. Visit https://eos.io/ (check the SSL certificate and make sure you are on the correct website) and scroll down to the bottom until you see "Get EOS" and click that button. 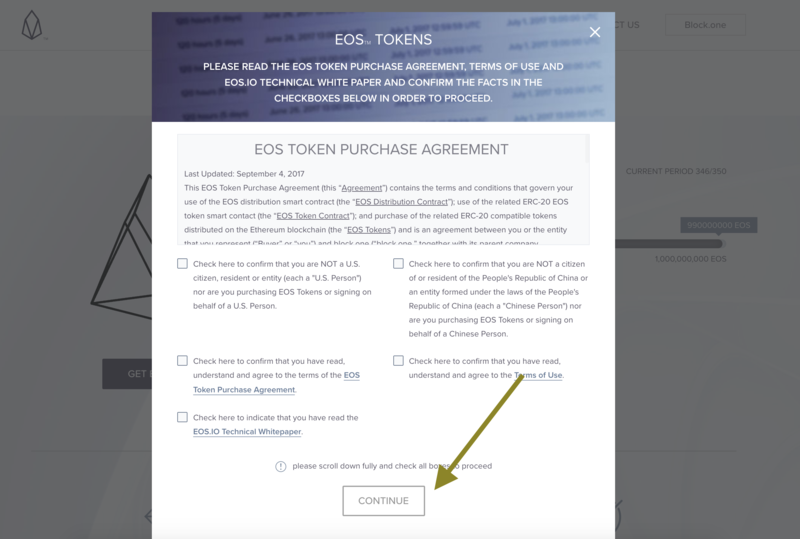 You will be asked to agree to the EOS Token Purchase Agreement, read and accept all of them, then proceed to click "Continue". Since this guide is not about participating in the ICO, choose "Register". 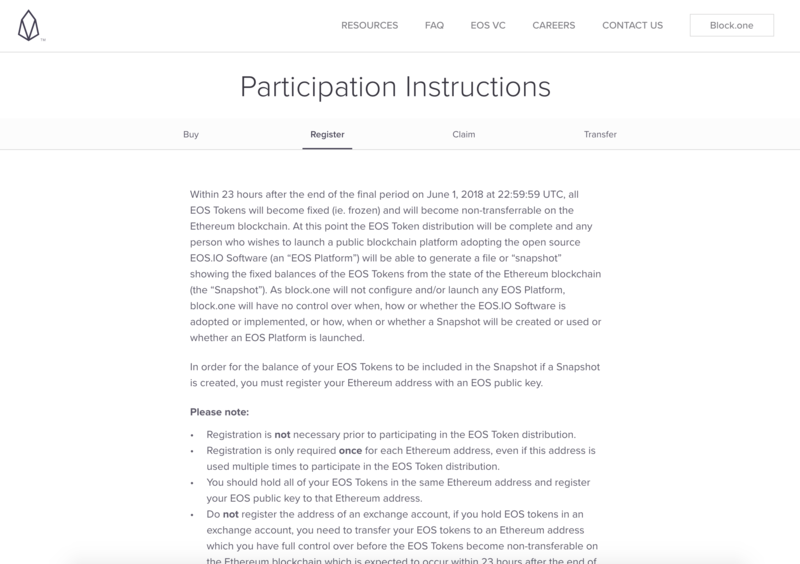 You'll be greeted with the participation instructions, read through them and scroll down until you see the next screenshot. 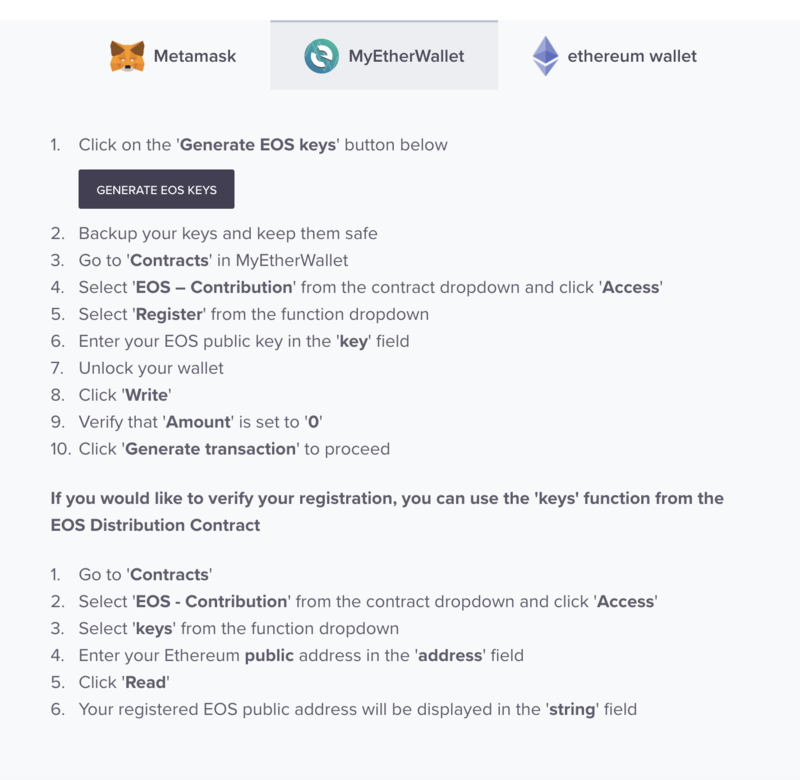 You have the option to register your ethereum address for mainnet swap using one of the following options, Metamask, MyEtherWallet (or MyCrypto), and Ethereum Wallet. Since there is no MyCrypto option here, choose "MyEtherWallet". MyEtherWallet and MyCrypto are equally similar and compatible. You'll see some public and private key pairs. Write them down or save this somewhere SAFE! Note: Do not use the public/private key in this screenshot, this is only an example. Your EOS.io webpage will generate a unique public/private key for you, use that. Copy the Public Key, you are going to need this in the next few steps. This is needed for you to access the EOS mainnet tokens when it launches. Now navigate to MyCrypto (again check the SSL certification, domain name, and ensure you are on the correct website!) in order to execute the EOS contract. Choose "Contracts" at the top navigation bar. 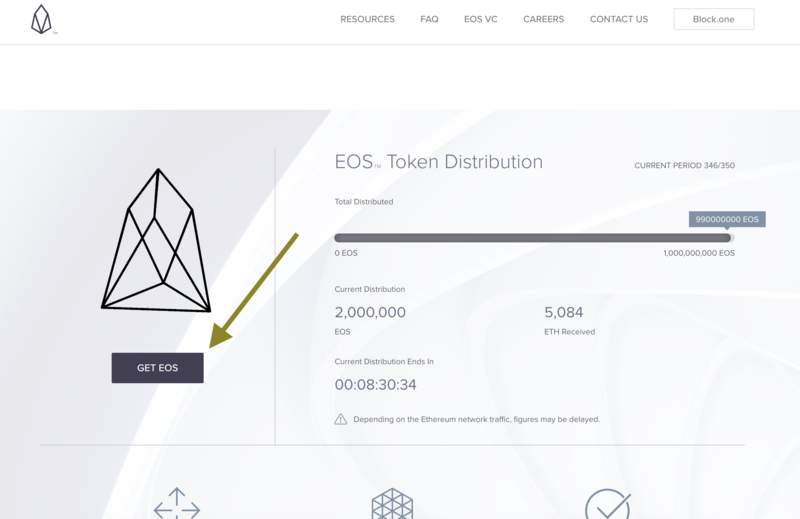 In the "Select Existing Contract", look for "EOS Contribution"
You will see a bunch of text populating the screen, don't worry about that and scroll down. In the "Read/Write Contract", scroll and look for "register"
Remember you copied the Public Key from the generated EOS public/private key pair earlier? Now it is asking, how would you like to access your wallet. You MUST use the wallet address in which the EOS ERC-20 tokens will be stored to sign this contract call. Set amount to "0", click write and generate the transaction and send! 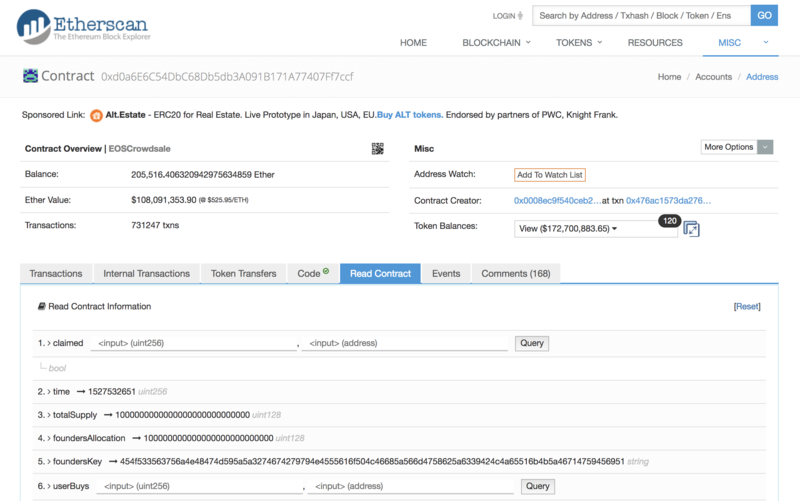 If everything is done correctly, wait for the transaction to be confirmed on the ethereum blockchain. Once it has been confirmed, let's verify that our EOS address has been recognized with Etherscan. 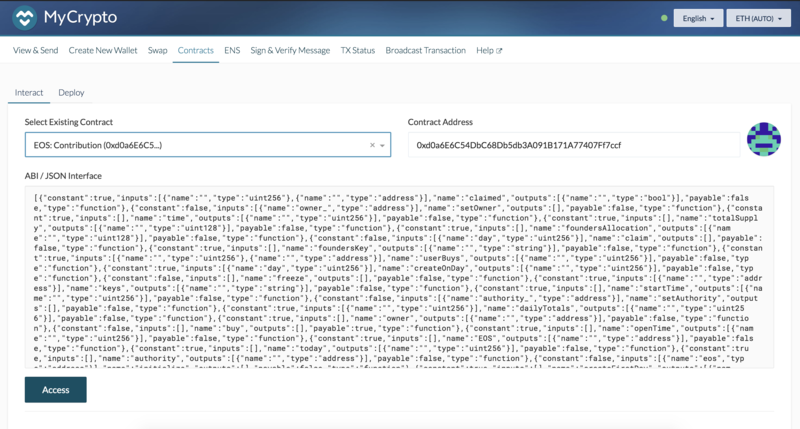 Navigate to the EOS Crowdsale Contract on Etherscan, and select "Read Contract"
Scroll down until you see "keys"
Input the ethereum wallet public address that has the ERC-20 tokens and the one that you used to sign the EOS contract call. If it returns the matching public key that you generated earlier, that means everything is good and all EOS ERC-20 tokens in that address will be ready for swap. Given the bear market in the entire cryptocurrency market, no one can say for sure what the EOS mainnet price prediction can be. However if you do own EOS, you want to be sure to be able to try the network when it launches! Embed EOS widget or access EOS data API on CoinGecko.